Frank Femenias is challenging you once again to solve a Mystery Foto. 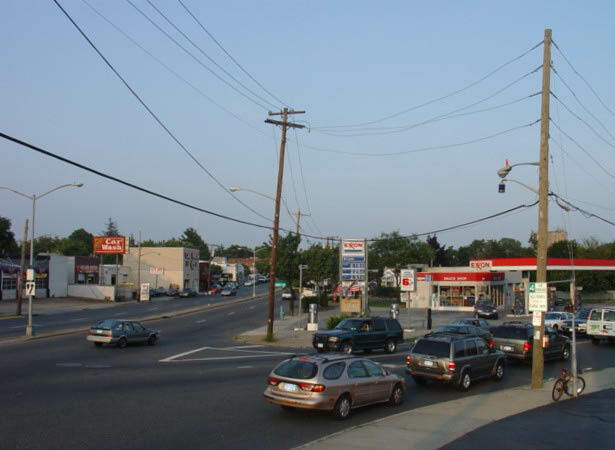 Looking east on Jericho Turnpike in Floral Park with Tulip Avenue on the right and Little Neck Parkway on the left. The Long Island Railroad bridge (Creedmoor Spur and originally A.T. Stewart's railroad) is in the background. 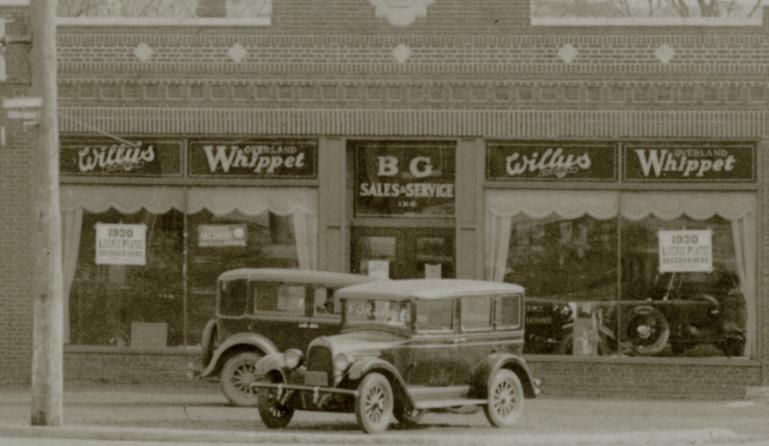 The B & G Sales & Service building is on the right, selling Overland Whippets and Willys-Knights. What year was this section part of the Vanderbilt Cup Race course? What year was the photo taken? 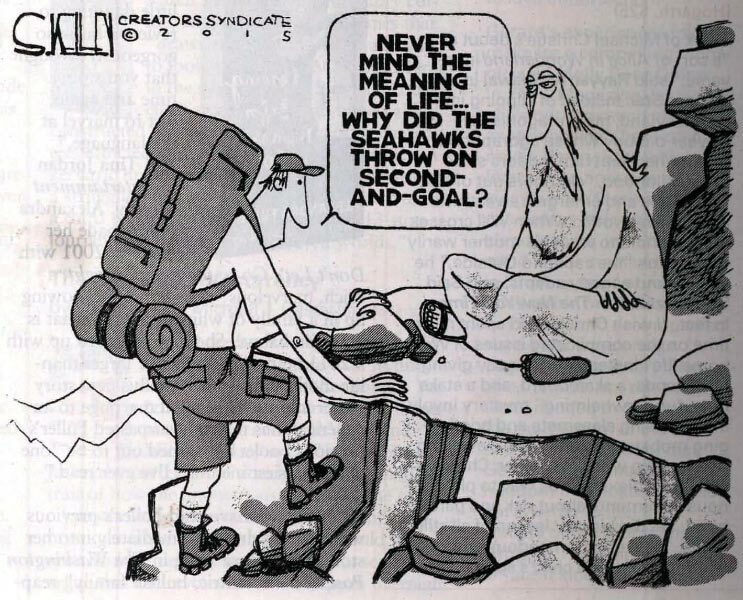 Provide your rationale. Winter of 1929/1930. See comments below. Congrats to Bob Krysiak, Brian McHale, Walt Gosden (the Floral Park Historian), Robert Greenhaus(see below amazing Greenhaus' Discoveries), Joseph Oesterle, Gerard Giarratana, Mitch Kahn, Tim Ivers, Steve Lucas, Brian McCarthy, and Greg O. for correctly identifying the Mystery Foto's location. 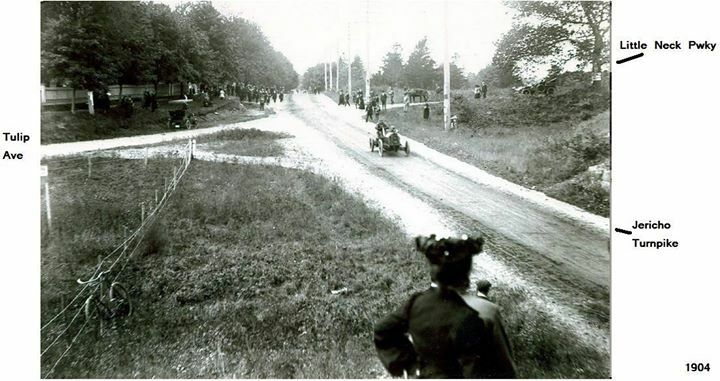 Kudos to Walt Gosden, Robert Greenhaus, Joseph Oesterle, Steve Lucas, Brian McCarthy and Greg O. for recognizing this section of the 1904 Vanderbilt Cup Race course. Thanks Frank for the submission and below Femenias' Findings. Jericho Turnpike and Tulip Avenue, Floral Park (formerly East Hinsdale), NY; at the Long Island Railroad (formerly Central Railroad of Long Island) bridge crossing Jericho Turnpike, facing East. Photo originally posted on Arthur John Huneke's Arrt's Arrchives and Sam Berliner III. Date:During the winter of 1929/30, perhaps December of 1929 or January of 1930. 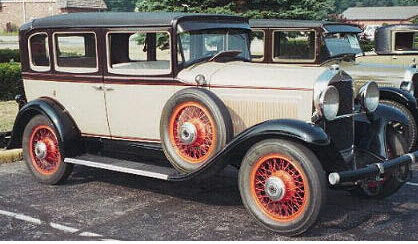 The sedan in front of the B&G Auto Services building (with “For Sale” painted across the windshield) is a 1927 or ‘28 Whippet 96, 5-passenger sedan with 1929 (yellow) NY License Plates. The posters on the showroom windows say “1930 License Plates” on the first two lines, the fender and side-mount spare of a 1929 or ‘30 Willys-Knight can be seen in the showroom window and the bare trees confirm that it’s winter; establishing that the photo was taken in late 1929 or early 1930. The sign for the Willys-Knight Overland dealership can be seen in the just below the bridge on the left. Here it is identified as c.1928 but I think it was taken at the same time as the mystery photo, during the winter of ’29/30. 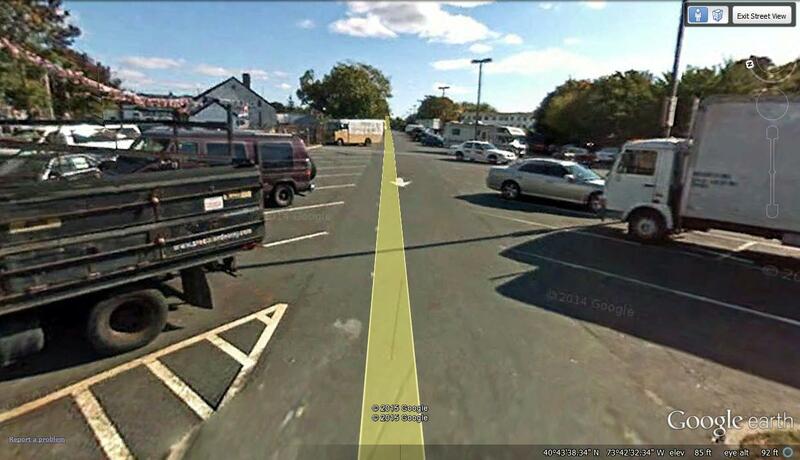 The car facing the camera, partially blocked by the pole, appears later than ’28 and appears to be wearing a light colored, probably yellow, license plate which would be consistent with ’29. The crooked utility pole and the street light attached to the pole are also visible in both photos. The pickup truck to the right in the photo could be a ’28 or ’29 Model A Ford Roadster Pickup but too much of it is obscured to positively identify it. In this c.1932 photo, the Willys-Knight Overland sign is again visible below the bridge, as are the ornate street lamps mounted on the telephone poles, which were visible in the mystery photo. 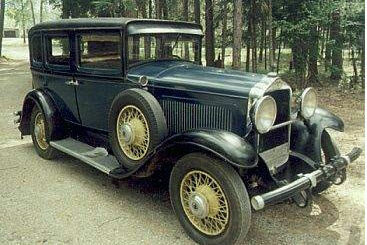 The car on the right side of the photo is clearly a Model A Ford Closed Cab Pickup, either 1928 or ’29. The three-story building which stood on the North side of Jericho Turnpike between the tracks and Little Neck Parkway, in the mystery photo appears to have been demolished to accommodate the widening of Jericho Turnpike. Well, the location is Jericho Turnpike looking east st cross street Tulip ave, on the right and Little Neck Pkwy on the left. The LIRR trestle over Jericho Tpke is the Creedmoor spur. I’m not sure of the year, but about 1928, or so seems right. Jericho Tpke. looking east Tulip ave to the right Little Neck Pkwy to the left. Central RR bridge. This is Jericho turnpike facing east in Floral Park, NY. Tulip Avenue is coming in on the right side and that building was a Willys Knight dealership. (my grandfather bought his Stearns Knight coupe in this dealership) the road to the left is Little Neck Parkway and the building on that corner was built but never occupied so was torn down a few years later. the railroad bridge is what was known as the Creedmoor Spur, and was originally part of Stewart’s Central rail road. 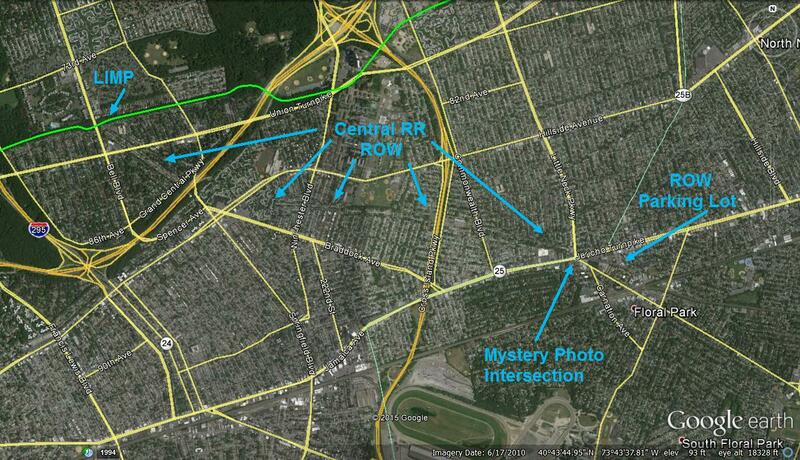 Nassau County on the right (south) side of the road, Queens County on the left (north) side of the road. 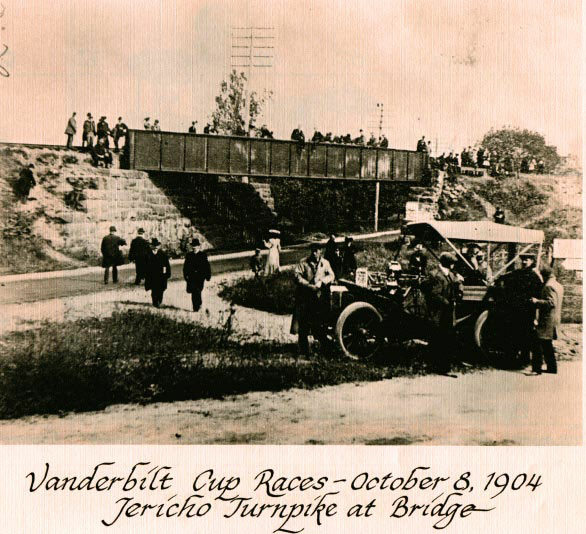 The only Vanderbilt Cup race to use this part was in 1904. Date of the photo would be about 1926 or 1927 as there are no trolley tracks - the tracks were removed in 1925. 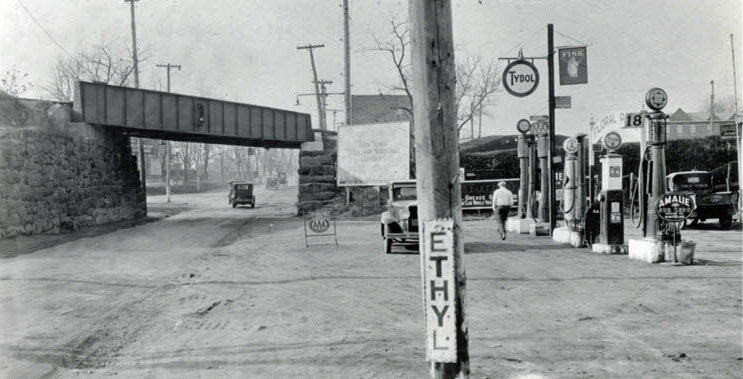 • Jericho Turnpike and Tulip Avenue, Floral Park (formerly East Hinsdale), NY; at the Long Island Railroad (formerly Central Railroad of Long Island) bridge crossing Jericho Turnpike, facing East. • During the winter of 1929/30, perhaps December of 1929 or January of 1930. 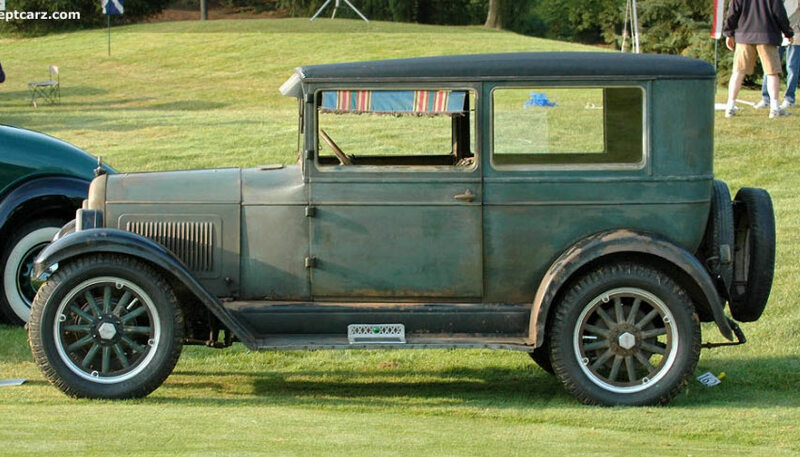 • The sedan in front of the B&G Auto Services building (with “For Sale” painted across the windshield) is a 1927 or ‘28 Whippet 96, 5-passenger sedan with 1929 (yellow) NY License Plates. 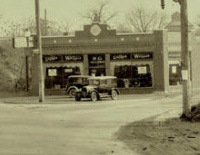 The posters on the showroom windows say “1930 License Plates” on the first two lines, the fender and side-mount spare of a 1929 or ‘30 Willys-Knight can be seen in the showroom window and the bare trees confirm that it’s winter; establishing that the photo was taken in late 1929 or early 1930. Jericho Tpke, Floral Park, Looking East. Photo Guess, 1930’s. Obviously after the use of traffic lights. In addition, I neglected to mention that this is also the intersection of Jericho Turnpike and the Little Neck Parkway, marking the southern terminus of the Little Neck Parkway. it’s been awhile has’nt it? The mystery photos look very familiar to me this week,but I’m not sure if they were part of the Vanderbilt Cup Race Course. I might have two areas in mind,not sure. This is Jericho Turnpike just west of Little Neck Parkway facing east (Tulip Avenue forks off to the right). That is the original Central Railroad/LIRR Creedmoor Spur bridge. My guess on the year would be 1908. 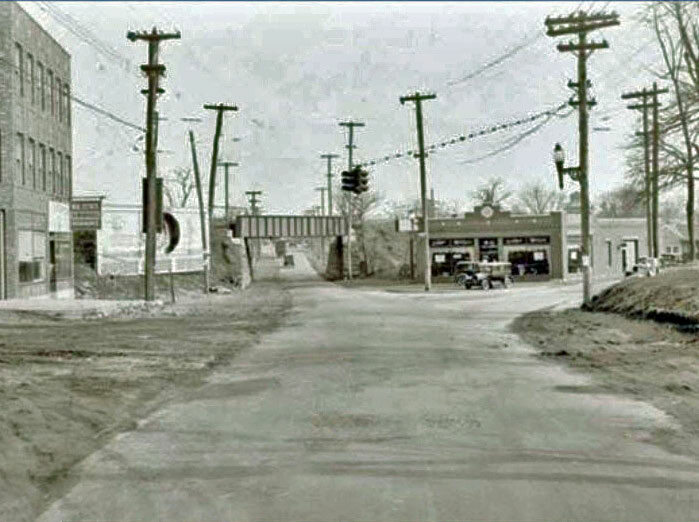 Floral Park, late 30s, Tulip Avenue looking southeast on left; Carnation Avenue on right. 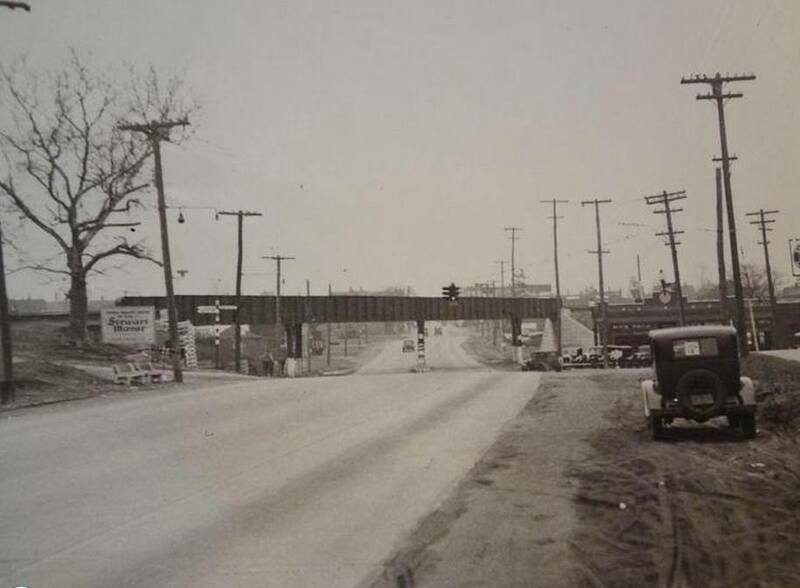 This photo shows Jericho Turnpike looking east in Floral Park with Tulip Avenue branching off to the right and the southern end of Little Neck Parkway at the left. This section of Jericho Tpke. was used in the 1904 Vanderbilt Cup Race. The bridge is for the Creedmoor spur of the LIRR, formerly part of A. T. Stewart’s Central Railroad. The building to the right of the bridge appears to be a Whippet car dealership and they were only produced from 1926 to 1931. The dirt area on the left side of Jericho Tpke. was where the trolley tracks were. Since the trolley service ended operations in 1926, I’m thinking this photo was probably taken around that year or maybe 1927. Good photo, Frank. Facing east at Jericho Tpke and Central RR trestle, with Tulip Ave heading southeast. This location was part of the 1904 VCR route. I personally can’t identify the exact year this photo was taken. My guess is 1930. With further research, I came across this exact photo on Arrts Arrchives; dated 1928. Hav’nt checked Arrts site lately, the old photos are excellant. I haven’t had the time to do enough research for the last few mystery photos, so I’m going to have to go with one of my knee jerk guesses again…None of which have been working out too well for me lately! Looks like the railroad bridge over Jericho Turnpike in Floral Park. I remembered an old blog entry from a while back of the location. Judging by the visible car and the fact that 3 color traffic signals were invented in the early 20’s, I’ll guess this was in the mid/late 20’s. Eastbound Jericho Tpke. 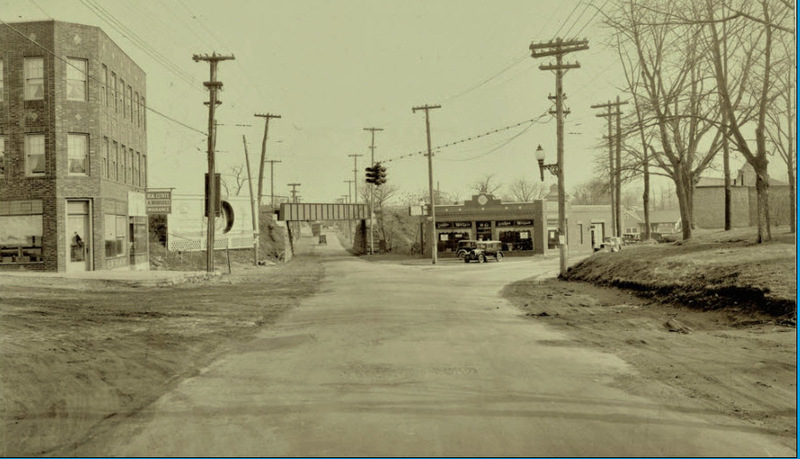 in Mineola just before present day LIRR crossing and Roslyn Rd. 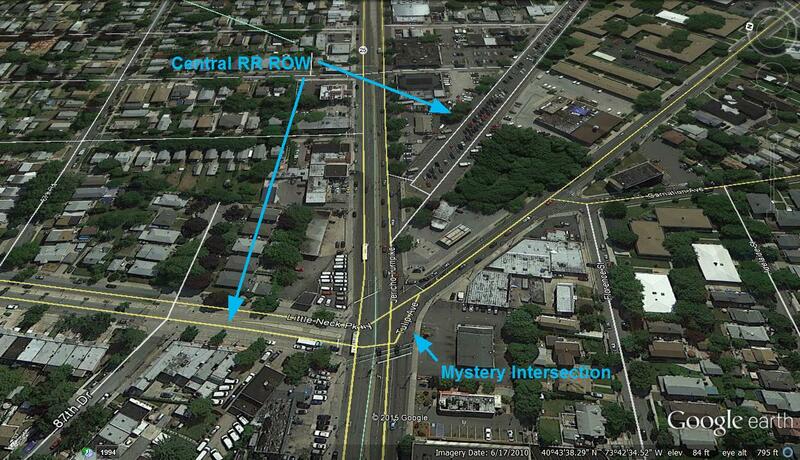 1906 - The race went under a railroad intersection as indicated on the accompanying map to be sent Howard. This is the turf of my childhood…playing on the abandoned Creedmore Spur…icing through the edges of backyards as the spur tracked west, watching the bridge get dismantled as the roads got )relatively) leveled. I live four blocks from this intersection on King Street. Our street is a historic block for the town. Our (100 year old) house was owned by the “blacksmith” of the town who also functioned as the wrought iron fence builder for John Lewis Childs, the owner of the nursery that dominated the town. The recent sign post on Emerson Ave (streets in FP are all named after flowers, trees and …poets!) and Jericho affirms the town’s position in the great heritage of the Vanderbilt race and parkway. Tulip, Carnation, and so on reflect East Hinsdale’s transformation by John Lewis Childs into Floral Park and his huge horticultural enterprise there. Walked by this location yesterday going to the KFC. Thought of these photos! I own one of the original Rhodes (George, A.D., Benjamin) homes on Little Neck Parkway, the last remaining one of 5 homes built in the 1800s on Little Neck Road, between Union Tpke. and Jericho Tpke. Aside from the Wesnofski farm on the Union Tpke./Little Neck Parkway intersection, not much at all is written about or has been photographed, as far as what I can find online, on this southern stretch of Little Neck Parkway. What I have been able to learn was gotten by studying old maps, from 1859, 1873, 1891, 1901/9, 1928. My mother bought the home in 1954, so I was interested in any info anyone might be able to provide in this lower, very little written about stretch of Little Neck Parkway, then called Little Neck Road in the 19th and early 20th c.